Does Windsor Hospital CEO know what’s going on? Submitted as a letter to the editor, Windsor Star. David Musyj, President and CEO of the Windsor Regional Hospital, asks last week “(don’t unions) know what’s going on in the world?” One could very well ask the same of him. Musyj should have known what the outcome of last week’s arbitration decision would be. After all, the OPSEU arbitration was not the first to be decided upon since the government introduced its wage restraint legislation. It was evident all along that the arbitrators would use last November’s OPSEU hospital professionals’ arbitrated central agreement as its guide. If he had read the legislation, he would have learned it didn’t legally cover these workers nor the time frame the collective agreement covered. If he was so short of money, he could have arrived at the same destination without the considerable costs and efforts surrounding the arbitration process by agreeing to these inevitable terms beforehand. Other hospitals did. Musyj might have also looked to the more than 150 other public hospitals across the province which are receiving similar funding levels and are mostly managing to balance their budgets despite such rulings. Yes, he signed an accountability agreement with the Local Health Integration Network legally requiring him to balance his budget, but had he read the fine print, there is an exemption in that language to allow for arbitrated decisions. Finally, while he was crying on behalf of the province that the cupboard was bare, he appears to have no comment when it comes to the $2.4 billion per year in corporate tax cuts the government is phasing in. Seems the cupboard is only bare for some, not others. Musyj could have had an agreement at the bargaining table. Instead he rolled the dice on long odds and predictably lost. Now we’re supposed to feel bad for him? From a member at WRH: I read this letter in the paper. Great work, right on the button and really written to make the point. Personally, I am baffled why our CEO should align himself with the wage freeze advocates. The province will sort this out and drop the boom through the LIHN and whatever they can screw us with, they will. Mr. Musyj would have been better to stand back and blame it all on the province. 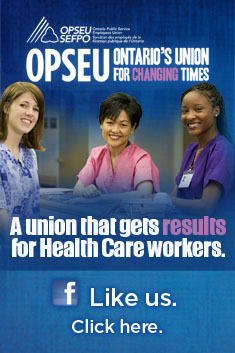 As it stands now, he has alienated all OPSEU staff with his comments and most of the other wage earners as well. Thanks again for the letter to the editor.